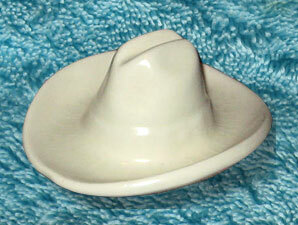 Cowboy hat ashtrays had their heyday in the 1950′s. 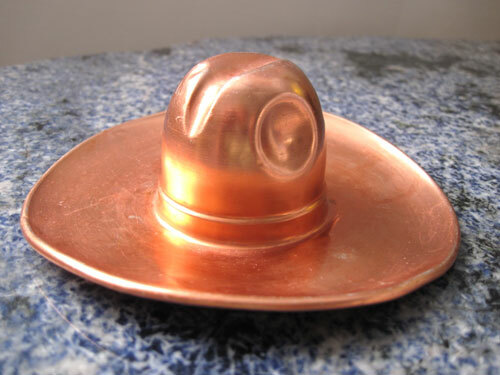 Made of tin, the dings and dents in this one make it more actual hat-like so I accept that the manufacturer didn’t spend the extra dime on sturdier material to grind ones butts out against. 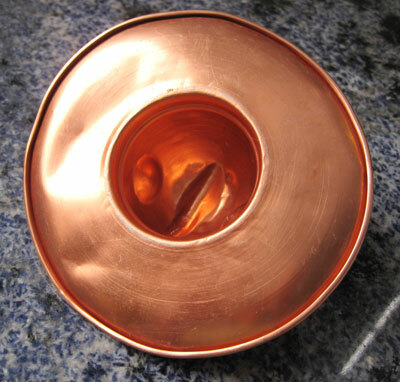 I have several of these but this coppertone one is my favorite. I’ve actually turned the ashtray over and used it as an appetizer size jello mold too. Originally 3 oz. of Avon perfume of undetermined name – Unforgettable, Topaze or OCCUR!, all of which came encased inside the Tower back in 1970. I used this once and couldn’t stand being around myself it reeked so bad so much of the contents remains. The bottles are fairly easy to find but usually sans perfume. I screwed off the cap for the first time in decades in order to write this and it still smells like vinegar and whiskey might have been some of the ingredients. 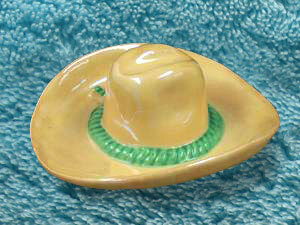 Bottle is 8-1/2″ tall with a goldtone plastic cap. Not a nick in sight. Originally 3 oz. of Avon perfume of undetermined name – Unforgettable, Topaze or OCCUR!, all of which came encased inside the Tower in 1970. I used this once and couldn’t stand being around myself it reeked so bad, so much of the contents remains. I love this packaging so much that if I ever chose to actually use this thing I’d scrub myself with the plastic on. The Photoshoped suds with the totally artificial drip pattern, the Disco-y lettering of Lovin’, the pink of the towel against the bleached pink of the skin – all kwintessential Kitsch aspects of this “More Healthy More Beauty” body scrubber. This “giant”(all 4 1/2″ of it!) 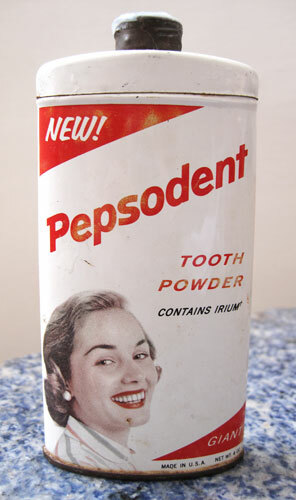 can of tooth powder was all the rage in the 1940′s and 50′s when the jingle, “You’ll wonder where the yellow went when you brush your teeth with Pepsodent!” flooded tv and radio waves. Pepsodent was famous for its powerful whitening ingredients, “I.M.P.” and Irium, but in 1994, then-FCC chairman Reed Hundt claimed that there was actually no Irium in the product at all. Despite this, the popular jingle and mere promise of whiter teeth made Pepsodent a huge success and the first product that used “radio as a medium for gathering listeners for the purpose of advertising to them”. Anyone see the male model who was supposed to show up for that Afro Comb photo shoot? 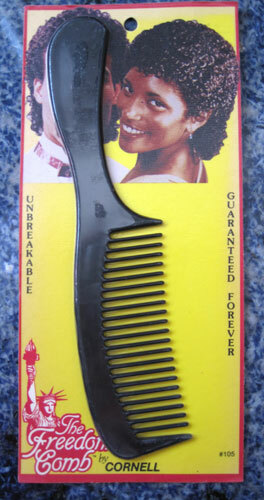 The Freedom Comb by Cornell was anything but for this poor guy who thought he was getting his big break here. Wouldn’t want to have been around when that free case of combs they promised him in his contract arrived. The packaging boasts “Guaranteed Forever” but forever will have to wait for this brokenhearted mystery man. 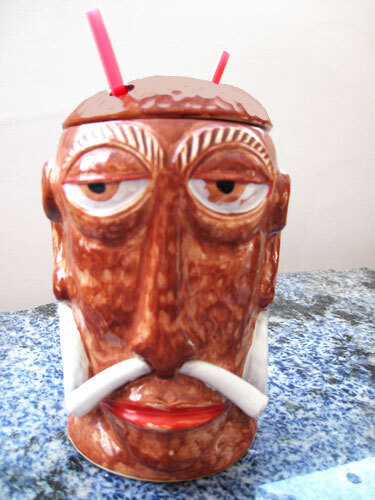 Nothing better on a Sunday than to lay back sucking on Mai Tais, Fog Cutters, Shirley Temples or whatever else you want to fill this vintage Mr. Bali Hai Tiki mug with. Custom made for the Bali-Hi Restaurant in San Diego, CA. and patterned after the 6′ tall Mr. Bali Hai sculpture that greeted diners at the front door, these 6.5″ x 4.25″ mugs are the Big Kahuna of Tiki mugs, larger than most with a top of the head lid and holes for two straws for maximum Romantic imbibing. 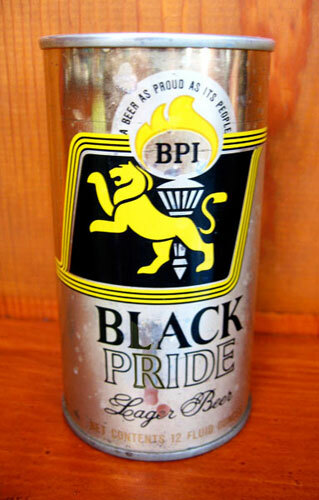 Debuting in 1969, Black Pride Beer was was concept first – “A Beer As Proud As Its People” – and beer second. Black Pride was the brain child of Edward J. McClellan, then Urban Program director of the NAACP in Chicago where the hope was that brewing the beer would pump the pride and stimulate the economy of black communities nationwide starting with Chicago’s south side where a large segment of the Black population lived. Black Pride may have stopped brewing in 1972 but Black pride has thankfully lived on. Debuting in 1969, Black Pride Beer was was concept first – “A Beer As Proud As Its People” – and beer second. With the hope of pumping pride and stimulating the economies of black communities nationwide, Black Pride was the brainchild of Edward J. McClellan, then Urban Program director of the NAACP in Chicago, whose south side where a large segment of the Black population lived was the first community served. 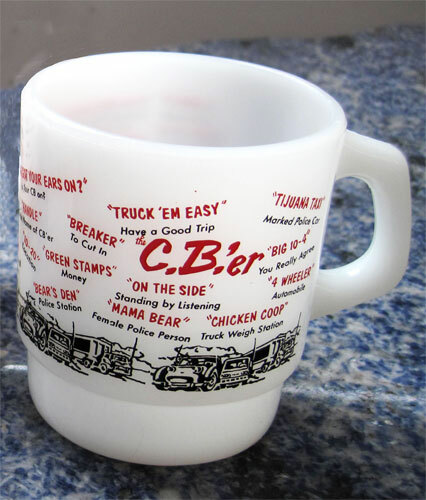 ‘Mama Bear” (Female Police person), “Green Stamps” (money), “Plain White Wrapper” (Unmarked Police Car) and the ubiquitous “10-4″ (Ok, message received) became the second language of Pop Culture in 1975 when “Convoy”, a song that glorified truckers and their C.B. radios, shot up airplay charts as fast as the big rigs and semis it glorified shot down highways. C.B. radio paraphernalia took over store shelves across the country with these Anchor Hocking ‘Fire-King’ milk glass Proof 6 cups at the top of the heap. Twenty six of the most frequently mumbled C.B. codes as well as an array of popular trucks grace the cup, of I own twelve (and counting). Ten regular, 3 3/8″ tall, and two tank size, an inch taller and five phrases richer. “Good day. Tapeworm of the Tickles. The stomach living within is for fun. Likes much the good food, Great friends are we to the extremity. 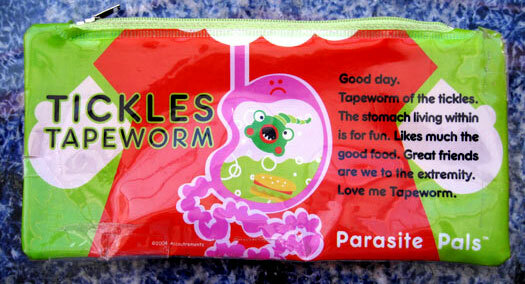 Love me Tapeworm.” I LOVE bad translations and this 8″x3″ of plastic wonderfulness is among the best! Tickles served as my billfold for the past four years until the plastic rebelled and one day little tapeworm-like rips appeared all over it. I reluctantly retired it to Kitsch Museum heaven but miss pulling it out to get my money and smiling as I dig intoTickles. These squished beer and soda bottles were all the rage in the late 60′s when the phrase ‘Sock It To Me’ crossed the color line to become the reigning colloquialism of the era. I have tons of ’Sock It To Me’ memorabilia as well as squashed and stretched bottle art but none so perfect as this smokeables receptacle made by Houze Art, USA.